For the past two years, I’ve posted a bunch of kind takeout menus from vegan-friendly caterers in the Los Angeles area. Here is this year’s updated edition! I have been using Kristina Brindley’s Seedling Catering for a while, and they are great. They also helped with my book launch party! Seedling Galette – seasonal apples, pears or a delightful combination of both on a flaky baked crust. You can see the menu here and email Kristina to place an order. Another great place to order a kind Thanksgiving dinner from in LA is Madeleine Bistro, a great vegan restaurant. They have a whole Thanksgiving-To-Go menu, and everything on this menu looks so good, and perfect for Thanksgiving. You can check out the menu here and call 818.758.6971 to order. 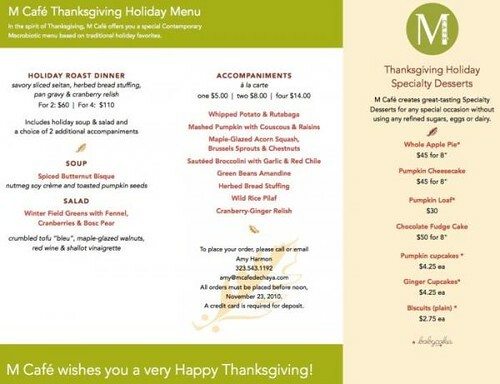 M Cafe also has a Thanksgiving Holiday menu that looks soo good. So many great vegan options! You can download the menu here, and call 323.543.1192 to order. 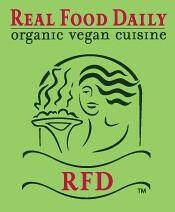 Order here or call 310.289.9910 in West Hollywood or 310.451.7544 in Santa Monica. Will you be cooking your Thanksgiving meal from scratch, ordering take out, or doing a combo of both? Previous PostA Yummy Pumpkin Cheesecake! Next PostAdopt a Turkey this Year!